The Moment arrives about 90 minutes into The Meyerowitz Stories (New and Selected). Adam Sandler and Ben Stiller, playing half-brothers are bickering outside a New York hospital. A stinging war of words devolves into a big, messy, physical, knock-down fight. In a snap of the fingers, I was no longer looking at feuding siblings but, instead, two of the most popular and financially successful comedy actors of the past 25 years — that’s a fact, jack — with zero Oscar nominations and undervalued critical respect between them. They were now middle-aged men, rolling around on a nondescript lawn emphatically trying to hurt each other, almost in a fuel of pent-up rage. Though Stiller had a small role in Happy Gilmore back in the day, this tete a tete was a first. It was hilarious. Riveting. And one of the many reasons why their sophisticated tart family comedy has unexpected verve. Oh, right. Sandler and “sophisticated” usually go together like Melania Trump and flip-flops. It’s well past time that we give the actor some credit. And actually, you know, refer to him as an actor. Though he usually caters his humor to 13-year-old boys, he also has an innate sweetness that makes his screen presence incredibly endearing. Think about The Wedding Singer, 50 First Dates, Big Daddy, Spanglish. If anything, Sandler frustrates because he’s lazy about his gifts — too often, he chooses to make garbage comedies like Grown Ups so he can hang with his old Saturday Night Live buddies. In The Meyerowitz Stories, he still gets to be the shorts-wearing man-child; only here, he shows off his full acting range. A sparkling Noah Baumbach-penned script helps. Sandler plays Danny, a loving stay-at-home dad to his college-aged daughter (Grace Van Patten) but a sadsack in every other department. He’s an NYC-based musician who never reached his potential. He knows all the words to the irresistible 1987 pop hit “Head to Toe.” Don’t you love him already??? After his divorce, he moves back in with his embittered dad Harold (Dustin Hoffman), himself a failed sculptor. Danny loves his dad unconditionally, though Harold mercilessly berates him for failing to live up to his potential. A benefit at the Museum of Modern Art is a humiliating disaster. Danny doesn’t even flinch each time Dad lovingly references his younger son Matthew (Stiller). The password on his computer is Exhibit A.
That’s Chapter 1. Chapter 2 revolves Matthew, in town from Los Angeles. He’s a successful financial manager feeling much better about his well-being ever since he moved 3,000 miles away from the insular ultra-competitive chaos. Matthew has the wife, the kid and the fancy job, but in his mind, this isn’t enough to please dear old disgruntled dad. A purported cathartic yelling session on the street is futile. In Chapter 3, the patriarch falls ill. (There are five chapters overall, with scenes abruptly cut-off mid-dialogue, mid-action to move along the story.) The siblings — along with introverted sister Jean (Elizabeth Marvel), intentionally pushed off to the side — must reconcile with the past and each other. That is, in a way that only adult siblings with long memories can do it. You will root for all. They’re all flawed yet big-hearted. 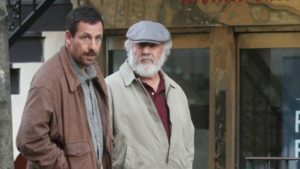 The Meyerowitz Stories had its world premiere back at May’s Cannes Film Festival. At the first press screening, I heard loud hissing boos as soon as Netflix’ bright red distribution logo popped up on the screen. European purist cinephiles were not having it. Sacre bleu! But I think this film and Netflix make for a perfect match. Netflix original movies have been a mixed bag in 2017 (ahem, Brad Pitt’s War Machine? Jake Gyllenhaal’s Okja?!). Sandler’s goofy comedies like Sandy Wexler don’t add much panache to the queue. This picture classes up the joint. On a random Saturday night, audiences should be clamoring for a sparkling, witty film that’s just art house-y enough to be provocative and mainstream enough to be popcorn-worthy. Watch it on the couch with your family. Then feel free to argue about it afterward.